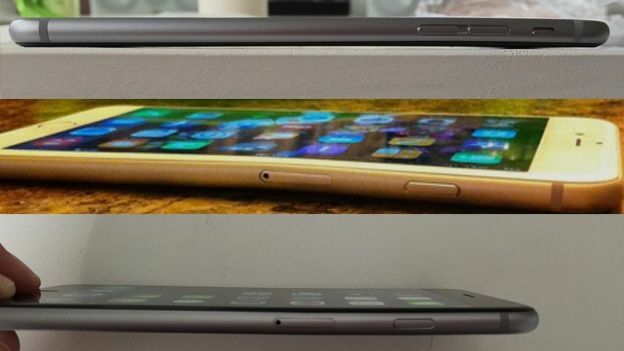 Reports have emerged that suggest Apple's supersize iPhone 6 Plus handset is prone to bending in pockets. Irate customers have taken to the MacRumors forum to voice concerns over the fact that the handsets are being damaged under normal use. The first to kick off the Bend-gate furore was a user called 'hanzoh', who posted an image of a clearly warped iPhone 6 Plus handset. "Yesterday, I left at 10am with the iPhone in my left front pocket of my suit pants," wrote Hanzoh, in his post. "I drove 4 hours to a wedding, which also involved a lot of sitting during dinner, but also 2-3 hours of dancing." "As I lay it on the coffee table and sat down on the couch to relax from the drive, I saw the reflection of the window in the iPhones slightly distorted. Now I lay it flat with the display side on the table, take a look." And sure enough, Hanzoh's handset was deformed, with the iPhone unit not lying flush with the table. It's important to note that this isn't an issue of the protruding camera causing a wobble effect - the images posted are display-side down. Since Hanzoh's revelation, many other iPhone users have spoken out about similar issues with their own handsets, launching fierce discussions across Twitter and Reddit. Some argue that users should be more careful with their handsets, and make sure not to sit on them. Others suggest that keeping a phone in a front pocket is considered normal usage, and the iPhone should have been designed to withstand minimal pressures. The reason for the bending issue is pretty clear at this point - Apple's iPhone 6 Plus is made of aluminium, is very large and, most importantly, very thin (at 7.1mm). This makes it incredibly susceptible to warping compared to other handsets. Apple's yet to comment on the #bendgate debacle, but it's probably wise to use your iPhone 6 Plus with care for the time being. If there is in fact an issue with smartphone warping then this is a huge design oversight on Apple's part, especially considering the phone's are under a week old.